It’s truly an honor to have be given the opportunity to make hip hop history by designing the coveart and providing an animated motion graphics version for this huge remake of the Mobb Deep classic “Survival of the Fittest”. The release includes production handled by Havoc and additional keyboards by Yung Fokus, with an official stamp of the giant sports broadcasting network ESPN. The release is available on the “Survival of the Fittest 2 EP” featuring 5 more tracks: Hide Away, What’s Going On, Life is What You Make It, All About It & Conquer. Ask any NBA player what’s included in their pre-game ritual, and there’s a 99 percent change bumping rap music to get pumped up is a necessity. And it make sense. The gritty lyricism and energy from rappers translates to the basketball court, where only the best and strongest will survive. No man is safe. 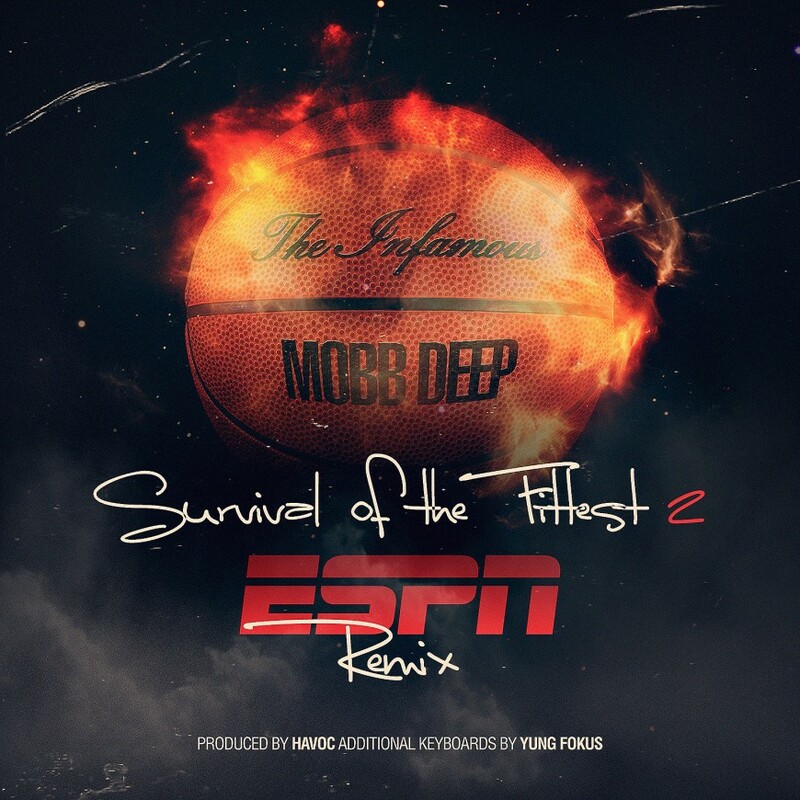 Today, Complex premieres Mobb Deep‘s “Survival of the Fittest (ESPN Remix),” which will be used for the opening of NBA Countdown on ESPN during the Western Conference Finals. This revamped version plays off Mobb Deep’s 1995 classic cut from their debut album, The Infamous, which turned 20 this year. As an added bonus, Mobb Deep also announce their upcoming Survival of the Fittest EP. The five-song project will include the remix as well as a handful of fresh new cuts to add to Mobb Deep’s impressive catalog. You can pre-order “Survival of the Fittest (ESPN Remix)” on iTunes, which will be available for purchase May 18. For now, check out the remix below and be on the lookout for its television premiere next week on NBA Countdown.